Jake McLeod and Matt Jager took advantage of perfect morning conditions at the Australian PGA to assume top spot on the leaderboard at 6-under through the first round with Australian Open runner-up Dimi Papadatos the best of the afternoon groups at 5-under par, level with Korea’s Jae-woong Eom. American Harold Varner III has begun his journey to securing a second Joe Kirkwood Cup in style making yet another superb start to the Australian PGA Championship at RACV Royal Pines Resort. The 2016 champion, Varner has not finished worse than sixth in three previous tilts at one of Australian golf’s most prestigious trophies and is positioned to contend again after an opening round of 3-under 69. Through 17 holes Varner was in a share of fifth at 4-under par before pulling his second shot into 18 left of the green and failing to get up and down but will have a chance to put pressure on the leaders when he tees off early on Friday morning. Inside the top 25 in four of his past five starts on his home tour, the 28-year-old said he hoped to use another good week on the Gold Coast as a springboard into 2019. “I’ve been playing well the last couple of weeks and just trying to hold on to that and keep doing my thing,” said Varner. Caught up in the drama surrounding Aussie John Senden’s snapped club on the ninth tee, Varner brought the fans in the Volkswagen Marquee to their feet at the par-3 16th and enjoyed the atmosphere that is being created, including the resident DJ. “It’s a pretty cool environment and that’s how you grow the game I think,” Varner said. For Papadatos, a win this week would erase the painful memories of narrowly missing out on his European Tour card this year. Victory in the European Tour co-sanctioned event brings immediate status while claiming the ISPS HANDA PGA Tour of Australasia Order of Merit would also provide a 12-month ticket to one of the world’s richest tours for the Australian Open runner-up. Holing out for eagle on the par-4 17th gave the New South Welshman momentum as he made the turn with four more birdies on the front nine putting him within one shot of the lead heading into the second round. “I think I was 1 over and that got me to 1 under,” Papadatos said of his eagle at 17. “The front nine I think with the wind today was playing definitely a bit easier than the back. The back’s a pretty good test, especially the way the wind was going. So it was nice to come home strong. “When you’re playing well, you want to make the most of it. When you’re playing bad, you’re trying to turn it around. 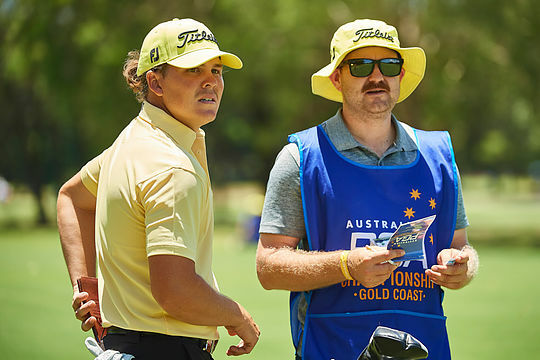 West Australian Jason Scrivener seemed destined to join McLeod and Jager at the top of the leaderboard at the end of the day until bogeys on his final two holes blotted an otherwise flawless round of 4-under 68. “I’m happy with the way I played, just unfortunately finished with those two bogeys, but other than that it was pretty flawless,” said Scrivener who is in a tie for fifth with Marc Leishman, Spain’s Adrian Otaegui, Mathew Goggin and Queensland’s Doug Klein. “The game feels like it’s come around the last two months. It feels like I’m getting more and more consistent.